Thanks for the love YYC. Stay tuned for 2019 details! 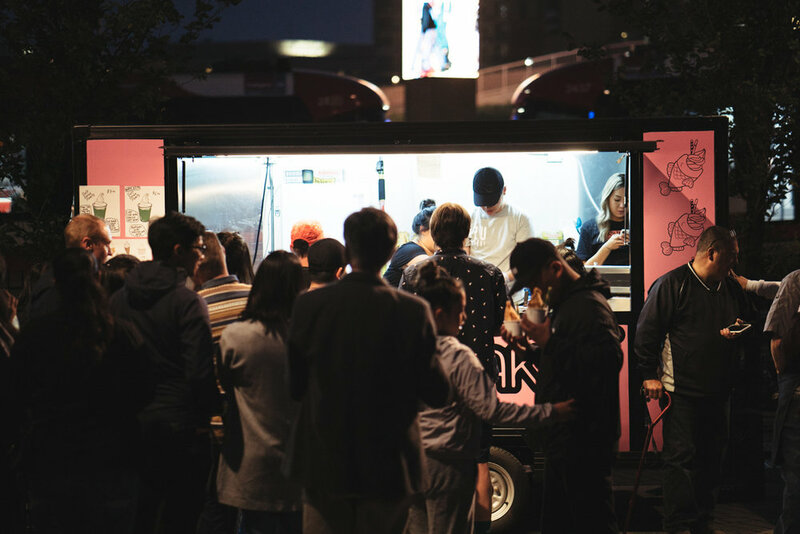 Moonlight Market is a non-profit organization dedicated to celebrating cultural diversity in Calgary through street-food inspired eats, local artisan goods and our city's artists in a night market experience. We had a steady stream of hungry people all converging in East Village to celebrate a night of diversity through food and experience. Celebrating cultural diversity through talent. Co-Host of DirtyNeedles, CJSW's friendly neighborhood hip-hop mix show. The Jing Wo Lion Dance Team has been performing in Calgary and area since the 1980's. Starting with just five adult men, it has since grown to over 25 members. They are currently comprised of a combination of children, young adults and adults ranging from ages 6 to 24, all of which are volunteers. Youth cultural performers from the University of Calgary Filipino Students' Association will be performing iconic Filipino dances like the bamboo dance, Tinikling. Total Gadjos are Gogol Bordello, Nick Cave, and Tom Waits covering Eastern-European Folk inspired post-punk septet based in Calgary. Playing Slovak traditionals, originals, and even chart topper covers in Eastern European style, they feature accordion, trumpet, sax, and clarinet in their instrument lineup. Total Gadjos will make your feet dance and your heart happy. SallieMae primarily performs as a solo vocalist, accompanying herself with either her electric or acoustic guitar. She draws musical elements of artists like Raquel Rodriguez, Bruno Mars, AJ Rafael, and Melissa Polinar to inspire her own expression. NΣΣT (pronounced “NEET”) is a Calgary-based electronic music producer specializing in "Ethnic Inspired Soul Rock Music", and improvised piano pieces. In the five years spanning his musical career, NΣΣT has emerged as an ever-evolving artist with influences ranging from Nujabes and Joe Hisaishi to City & Colour and Sebastian Tellier. To date, NΣΣT has released over a dozen projects on Bandcamp, gained over 20,000 followers on Soundcloud and achieved over 5 Million plays collectively. The Rondel Roberts Band (TRRB) is a neo-soul band from Calgary, Alberta, that borrows from a variety of classic and modern genres such as 70's soul, feel good funk, classic rock and golden era boom bap. TRRB adorns groove/backbeat oriented performances with contemporary original content and reinterpreted covered material that is bound to make listeners move. Doing double duty as an acoustic singer songwriter, as well as a rapper, Rome is a musical story teller sharing anecdotes over acoustic and electronic productions. His music takes root in many styles such as Soul, Jazz, Hip-hop and Rock. Producing under Konscious productions, Rome strives to compose meaningful collaborative pieces with local artists, and crafting original works for live performances. Lend the shy guy an ear and he'll sing to your soul. Harpreet is a spoken word poet and author of two books; one a collection of poetry and the other a short story for children. Her poetry is refreshingly positive in nature, exploring the properties of the soft power of love between two souls who are dedicated to one another. Aya Mhana is a Syrian newcomer, a musician, composer and a writer. She plays the oud, a stringed instrument commonly found in middle-eastern music and is part of the local Calgarian band Hymn.